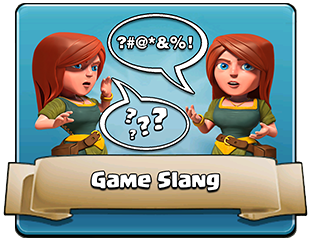 The Game Slang is one of the General elements of the Clash of Clans game. DPS – Damage Per Second. IAP – In-App Gems Purchases. HP – Hit Points, Health. Attack Strategy – A method of attacking in order to achieve a specific goal, usually farming, trophies, or both. An attack strategy consists of a specific complement of troops and spells, and a step-by-step guide to deploying those units in the most effective way. Defeat – The outcome of a battle when the attacker fails to earn any stars. The attacker will lose trophies which will be awarded to the defender. Loot bonuses (if any) will not be triggered, but the attacker keeps all the resources he/she raided from the village. Clan – An in-game group of players who join together both socially as well as from a gameplay perspective. Clans can compete with other clans by pooling their trophies to see which Clans have the highest overall trophies. In addition, clanmates can donate troops to each other using the Clan Castle, and talk to each other using a private Clan Chat. They can also compete in Clan Wars for bonus loot. Cup – A common alternative to the term Trophy. Damage Per Attack/Shot/Hit – The amount of damage a unit or structure inflicts each time it attacks. Not to be confused with Damage Per Second. If (and only if) a unit attacks once per second, Damage Per Shot will equal Damage Per Second. Defense – Depending on context, refers either to Defensive Buildings or defensive Raids. Ground Troop/Unit – Ground troops are troops that travel on ground only. In game terms, they must destroy or go around walls (unless they can jump over them innately like Hog Riders or are under the effect of the Jump Spell and will tend to walk around buildings and decorations unless there is no other path. They can be targeted by Troops and Defenses that can attack ground troops, but not by those that can only attack air troops. Housing Space – A measure of how much room a troop requires in either an Army Camp or a Clan Castle. An Clan Castle or Army Camp that has a capacity of 20 housing units can hold 20 Archers (1 housing unit each), 4 Giants (5 housing units each), one Dragon or another combination of troops that does not exceed 20 housing units. Freemium – Business model where an app is given away for free, and then its users are encouraged to make In-App Purchases. Clash of Clans is a freemium game. Fractional Damage – The concept where the damage that a unit causes does not have to be represented as a whole number. Within Clash of Clans, several units cause fractional damage per attack, especially those with high attack rates. According to Supercell, Hit points are kept to two significant digits. Layout – Refers to a specific distribution of buildings, traps and walls. Each layout is typically designed for a purpose (protecting resources, protecting trophies in general, defending against a particular troop like a Hog Rider, etc.). Different layouts not only cause troops to behave in a certain way, it also will typically dictate the attack strategy employed by the opponent. Meat Shield – A meat shield is one or more troops used as a “distraction” to draw fire away from other troops so they can do damage. The Giant is obviously the most common meat shield because of his high health. A P.E.K.K.A is also a great choice for a meat shield because of her high health and high DPS. However, because many people don’t have/can’t afford a P.E.K.K.A, they use Giants instead. Melee – Disorganized, free-for-all, close quarters combat. In Clash of Clans terms, a melee troop is one that attacks via hand-to-hand combat as opposed to at range. If a melee troop is in range to attack another troop, that troop can always attack back. Multiplayer Attack – See Raid. Multiplayer attacks refer specifically to those raids against another user, and often refer to only those attacks that occur as a result of multiplayer matches (those that trigger the trophy league loot bonus if successful). Multiplayer Match – Multiplayer matching is the act of selecting the “Attack!” button on the main screen and then clicking “Find a Match” (for a nominal fee of Gold). If a player is currently in a Trophy League and successfully attacks using “Find a Match” (i.e. achieves at least one star), that player will receive the loot bonus associated with that league. Nexting – A verb used to describe searching for a base to raid. ex: I keep nexting but can’t find a good base to attack. Parent Troop – The reciprocal term of subtroops, referring to Golems, Witches and Lava Hounds. They split into or summon their corresponding subtroops. Raid – A raid is an attack on a Village, either yours (i.e. a Defense), another user’s (i.e. a Multiplayer Attack or Clan War attack) or an NPC village (as part of the Single Player Campaign). At least one troop or spell (or the Clan Castle) must be deployed for it to be considered an attack. If at least one star is earned, the attack is considered successful, and if no star is earned the attack is considered a failure. In multiplayer attacks, trophies are earned for successful attacks and lost for failed attacks, and if the attacking player is in a trophy league a multiplayer victory will also trigger the league’s loot bonus. Revenge – A raiding feature that allows a person to attack someone that has attacked them. Royals – A common alternate term for Heroes. Splash Damage – Damage that applies to all units within a specified radius of the targeted unit. Contrast with Single Target Damage. Subtroop – A generic term for Golemites, Skeletons and Lava Pups. They are only spawned by their parent troops, and can’t be trained, placed directly, or donated via the Clan Castle. Victory – Defined in Clash of Clans as a successful attack in terms of Stars: earning at least one Star will result in a victory and trophies will be earned from the player that was raided. Victories will trigger loot bonuses if the player is in a league, and allows the player to earn war win bonuses in Clan Wars. Village – The general term for a player’s controllable 44-by-44 area within Clash of Clans. A player’s village consists of the Town Hall plus all associated buildings, walls and decorations. Collector, Pump – Elixir Collector. Sometimes also used in the general sense to refer to Gold Mines and Dark Elixir Drills as well. Farmer – A player who primarily engages in farming. Farming – Method of gameplay where the player focuses on acquiring Resources instead of Trophies. Gemmer – A player who regularly buys and uses large quantities of Gems.